Canoe Map of Charles River Bird's-Eye View Showing Carriers, Dams, Etc. This is a beautiful 1907 bird's-eye view style pocket canoe map of Charles River, Massachusetts by the Boston map publisher George H. Walker. 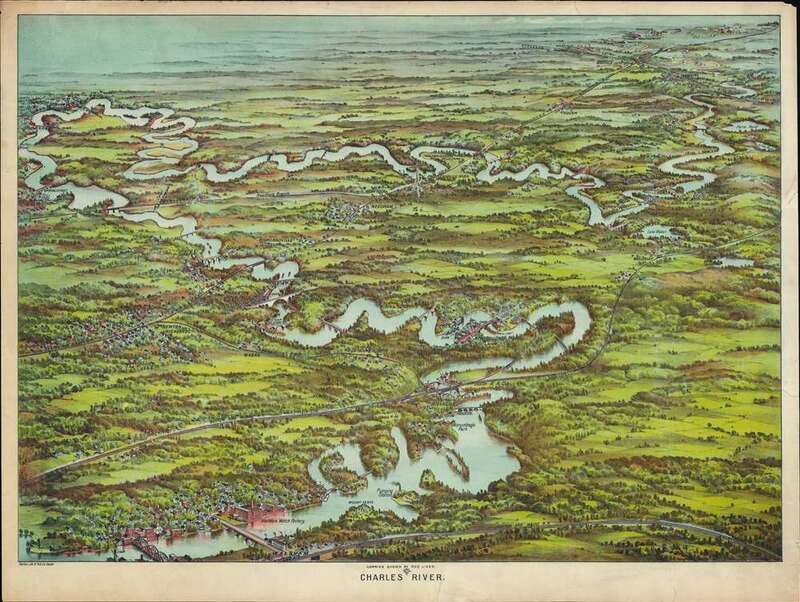 Printed with a multicolor lithograph process, Walker's view covers the winding Charles River from Waltham to Medway and includes Riverside, Newton, Wellesley, South Natick, Dover, Needham, Waban, Dedham, Medfield, Rockville and Highlandville. Several landmarks including the Waltham Watch Factory, Mount Feake Cemetery, Norumbega Park, Walker – Gordon Milk Farm and the Echo Bridge near Newton Upper Falls are also noted. Dams, bridges, lakes and pumping stations are identified. Walker also notes a number of railway lines and stations throughout. Walker is better known for his similar view maps of Boston Harbor - the present example is thus somewhat out of his focus area and very scarce. Published by Walker Lith. and Pub. Co., 400 Newbury St., Boston, Mass. Very good. Minor wear along original fold lines. Professionally flattened and backed with archival tissue. Accompanied by original cover.